Thunderstorm Cookbook – EHFC Members Talking! Today was a great laboratory for hatching thunderstorm activity. It was severe clear in the morning and mostly calm. The muggy feel and heat tend to make everyone suspect thunderstorms but what is the real indicator or “trigger” for convective activity? One essential ingredient is a steep temperature drop with altitude. If the air cools more rapidly than usual in the climb get suspicious. Meteorologists call this CAPE or convective potential. Compare adiabatic cooling (heat loss due to expansion) to ambient temperature drop. The more quickly the air cools as you climb, the more unstable the air and more probably airmass thunderstorms. Think of a balloon full of hot air rising…if the air inside cools quicker than the outside air it stops going up…If is cooler outside it keeps going up (or accelerates!) Today at 4500 was quite pleasantly chilly though hot and muggy on the surface…watch out! The presence of moisture is also a necessary indicator. “Muggy” is a little too imprecise. Watch for a dewpoint above 20 degrees Celsius…this is a sure indicator of TSM…there is plenty of moisture for free convection. The last ingredient besides unstable air and moisture is a lifting force. Today a cold front came “shoveling” from the west. Remember colder air is denser and runs along the surface lifting the moist warm air ahead of it. Perfect recipe for thunderstorms; boom, a whole line of severe storms rolled through after lunch…as predicted! This seems like August weather and it is not even official summer yet! This kind of weather is also the perfect opportunity to pick your favorite iPad or desktop app and correlate what it’s showing with what you see out the office window. You’ll find a ton of iPad applications for displaying radar images and plotting lightning strikes but you need to spend time learning how to use many of the interesting options. If you’re planning to use any of this functionality in flight it’s especially important to know how to operate the tools and interpret the data before adding the distraction and stress of being in the air. We’ve been using RadMap because it allows selection of the “National Mosaic Mode” or Nexrad Browser mode where you can select one facility at a time such as BUF, BGM, TYX or CCX to see what’s happening around home. It also allows seven different radar modes. For cell motion and other quick metrics weatherTAP does a great job and it offers something like sixteen radar modes. The apps mentioned above get their data over WiFi or cellular 3G but XM Satellites and ADS-B ground stations bring life to the weather offerings in WingX and ForeFlight which have their own weather display modes! What weather apps to you use? Great point Mark…thanks! There are almost too many wx apps and the key is picking one you like and learning how to reliably extract meaningful information from it. I like AeroWeather because it is how I plan; synoptic (big picture) then fine tune depending on possibilities. Nice Blog… very simple to understand and easy to grasp. – If you are heading east – leaving EARLY was the ticket. It would be warm, muggy, and bumpy down low, but you’d stay out ahead of the weather. Climb high into the cooler air which will be far less bumpy. – Heading west – There are a couple of options. One is wait for the coldfront and thunderstorms to pass through. Given how fast the coldfront was traveling today (over 50knots), a ground wait might be only an hour or two. The backside of this coldfront was a lot cooler, still IFR for a while, but cleared up nicely the further west you flew or the later it got. By 6pm today, KITH was pretty much in the clear. The other option is to plan a flight that ends in a landing at an airport before entering the weather. 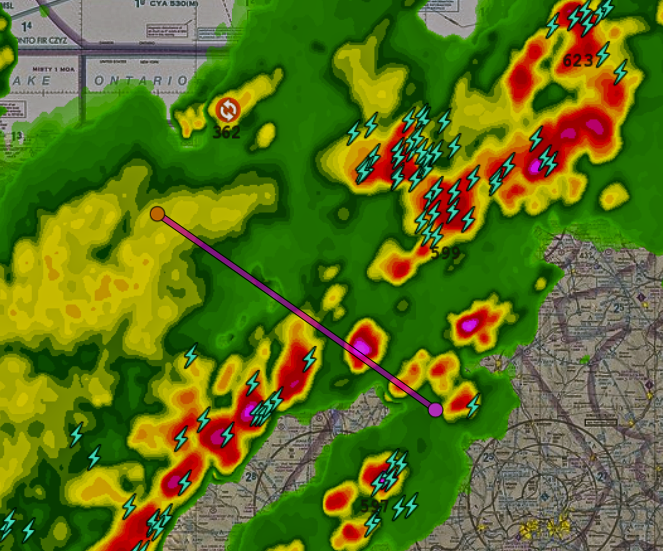 This takes more planning and it sure helps to have NEXRAD weather or radar on board. If traveling from east to west, make sure you’re on the ground well ahead of the storms. Don’t forget to tie down the plane or get it into a hangar. – Even if you are IFR rated, try hard to stay out of the clouds. Any cloud ahead of the front is going to be full of bumps and if you can’t see out, you might fly into a forming thunderstorm that isn’t producing any rain, yet. Ask for deviations around the weather. And if you can’t get what you asked for, get a clearance to turn around and find a place to land. Aspen Connect: iPad in the Panel!